Today's tiny house tour is an ode to French-Canadian workmanship. As the first wheeled inception to come out of Quebec's Minimaliste Houses, the majestic Sequoia is a model creation in more ways than you can imagine. Its builders claim that the Sequoia is a prototype, an experimental venture, as they tried out various features and ideas during their pursuit of the ideal tiny wheeled home. The final product is a marvelous wonder that the Minimaliste masterminds should celebrate with pride. Allow us to show you exactly what we mean as we explore this exclusive tiny house creation. Here is your first look at the Sequoia's amazing wooden exteriors. This tiny house on wheels measures 20-by-8.5-feet (6-by-2.5-meters), and is very much a reflection of Minimaliste House's overall mission and vision. You don't need to speak French to understand what "minimaliste" means, and you only need to start exploring the Sequoia tiny house to notice their commitment to the finest and most sustainable construction details. So much so that this incredibly designed tiny house comes with two solar panels and a hybrid autonomous electrical system. A front view of the sleek Sequoia exteriors presents us with a retractable balcony, the aforementioned solar panels, and stylish black door. True to minimalist fashion, all these essential tiny house features play an important role in the Sequoia's aesthetic composition. 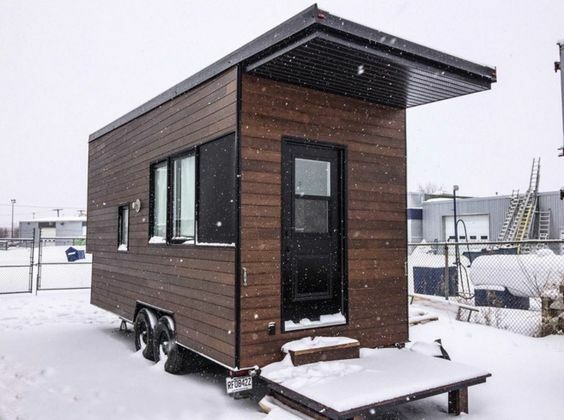 Obviously, a tiny home from Canada needs to take into consideration the iciest weather conditions. As you can already tell by the Instagram caption, the Sequoia tiny house comes with all the insulation and heating needed to make it warm and cozy all year round. As we step inside this charming dwelling, we are welcomed into a world of brightness and prestige. White walls, bamboo flooring, and ample LED lighting work in perfect harmony to enhance the Sequoia's brilliant appearance. The Sequoia comes with two of these foldout tables - this one, to be used for dining, and another on the opposite side which can be used as a desk. As we continue walking straight ahead, we will arrive at the Sequoia kitchen. Now, this area is full of surprises. Along with all the essential amenities, including a full-size refrigerator and a four-burner stove, the kitchen has been cleverly engineered with an array of efficient storage capabilities. If you're a seasoned tiny house connoisseur, you will know that the best designs add a creative flair to practicality. And here is the perfect example to illustrate this in action. These hidden compartments are just some of the many hidden treasures that come with the Sequoia. Another nifty addition to the Sequoia tiny house kitchen, these mason jars can be used to store your spices as well as serving their gravity-defying decorative functions. But wait - there's more! Minimaliste Houses wanted the kitchen and bathroom to complement one another in a way that maximizes the compact space in this tiny home. This is where that handy little counter trick you're seeing here comes into play. The extra countertop does more than create extra prep space for the kitchen - it also helps to hide the bathroom from view. Customization is at the center stage with the Sequoia. The bathroom comes with a composting toilet, and you can choose between a shower or a bathtub for your tiny dwelling. Tiny home buyers will also be interested to know that this wheeled house has a sustainable hybrid plumbing system, which gives you the option of using a pressurized water tank for off-grid living or going for conventional hookups if you prefer a regular water supply. Did you spot the mirror cabinet above the bathroom sink? If so, this is what it looks from the inside. This is a Sequoia bathroom with a 30-by-40-inch (76.2-by-101.6-centimeter) shower installed. The Instagram caption says it all, really - warm showers are always a given when you have a tiny house with its own on-demand water heater. Last stop for our Sequoia tour is the luxurious sleeping area. Proving that simple gestures can go a long way, this tiny house makes it very simple to stow away the loft's ladder without having to hide it completely from view. And thus we reach our final destination. With a spacious sleeping area that provides plenty of head-space and legroom, this loft is the perfect place to lie back and relax after a long day. The two awing windows that you see in this picture have been designed so that you can keep them open at anytime you wish, even if it's raining. Actually, the smaller window by the head of the bed has been installed with great care so as to not be directly above the pillows - a design flaw which the Minimaliste Houses team claims to have seen in tiny constructions too many times. For a prototype, the Sequoia is very much complete. All that prospective tiny house buyers need to do is add their personal flair to it. With sustainable additions and a plethora of creative design conventions, this masterful tiny home is sure to please all dwellers, from Quebec and beyond.